Find a printable list here. One month ago I was flipping out about gaining weight. A ton of weight on my petite frame is about 5 pounds. In the past, when I got desperate, I would skip past counting calories and go low carb. When I'm counting calories the weight loss is annoying because I get tired of tracking and being glued to weighing and measuring everything. With Paleo you eat what you want, when you want. I was getting annoyed at the scale to the point it was consuming me. That is when I knew it was time for me to change. So, I put the scale away and looked up the Paleo diet. The Paleo diet is also known at the Cave Man diet. You will be getting rid of the processed garbage in your life. You eat like a caveman would. 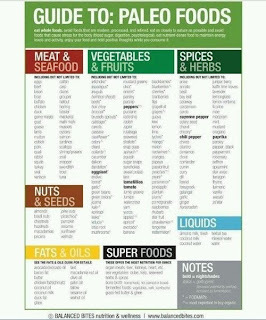 You can have fruits, nuts, veggies, meats, fish, and certain fats. I think it only took a day or two for me to get use to this new diet. It was not hard, like going low carb. I quickly found replacements for my junk food. I love chocolate and pasta. I replaced my love for pasta with kale chips. They are simple and easy to make. Here is a link to kale smoothies and chips. As far as the chocolate, you are allowed to have 70% or higher organic chocolate, but don't go crazy with it. My new chocolate love has been Almond Dream ice cream. It is made of almonds and heavenly. In one month, I have lost 3 pounds. I allow a cheat day on Friday. So, if I was eating 100% Paleo 7 days a week I probably would have dropped 5 pounds. I have about a pound and a half to go to my happy weight. I read on a Paleo website that your weight will naturally fall to were it should be. We will see where I land. I'm not buying new clothes. So, where do you start? Try PaleOMG, she has lots of great recipes. Good luck and let me know if it works for you!